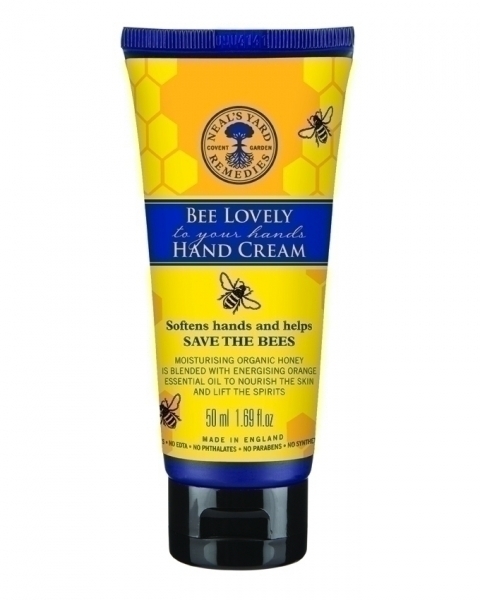 I have been using the Neal’s Yard Remedies Bee Lovely hand cream for a few days now and I’m really impressed with it. I have to say, I’m not surprised at all. I’ve been a fan of the company for a long time and love their Melissa and Garden Mint and Bergamot hand creams. In fact, at the moment, my daughter is using the Melissa cream to prevent her little hands from getting dry (lots of hand-washing going on!) and she loves it too. The Bee Lovely hand cream is being sold to raise funds for three charities involved in supporting the bee population, which as I wrote about the other day, is in serious need of help. It’s a cause that I completely support, but I really wanted the product to be great too and thankfully, it is. Its a pale cream colour, and is slightly thicker than the other Neal’s Yard Remedies hand cream we have. It has a glorious orange smell, courtesy of the essential oil and, although it’s quite thick, it’s really easily absorbed into your skin so it doesn’t leave a greasy feeling afterwards. It’s got sunflower and brazil nut oils in, to help create the softness, as well as the all-important honey! 76% organic, with no parabens, synthetic fragrances or odours, mineral oils or other chemical nasties, this is another winning product from Neal’s Yard Remedies and I really rate it highly. So, I do recommend you either go along to your local branch of Neal’s Yard Remedies (where you can also pick up other Bee Lovely information) or have a look at their online store to buy your own tube of Bee Lovely hand cream. Either way, please do also sign their pesticide petition and help them to save our bees! One Response to Neal’s Yard Remedies: Bee Lovely hand cream review.